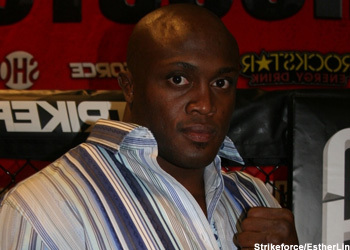 Following his disappointing performance against Chad Griggs on Saturday night, it appears Strikeforce CEO Scott Coker may have hopped off Bobby Lashley’s bandwagon. The soft-spoken promoter took his skepticism of the former WWE superstar a step further while appearing as a guest on MMA Nation Radio. In addition to his inexperience in the violent world of MMA is the added hoopla his 265-pound frame must shoulder, courtesy of his fake-fighting days inside the squared-circle. Lashley was rushed to the hospital on Saturday night after failing to answer the 3rdRound horn. Although Kristal Marshall Tweeted her boyfriend had received “very scary news” from doctors, PWTorch reported yesterday Lashely was just “extremely dehydrated” after 10 long minutes of fighting and was treated with multiple IV bags. Coker told MMA Nation that Lashley has already reached out to Strikeforce brass requesting to avenge his poor showing, STAT.